It seems like I'm designing poster after poster nowadays. It's not that I'm complaining or anything because they're a ton of fun to do. Guess my problem is the more I do, the harder it is to come up with something new. But I guess if it were always that easy, it probably wouldn't be that satisfying in the end. A great example of that is that Police Academy where they go to Russia (#6, i think). Talk about a letdown. 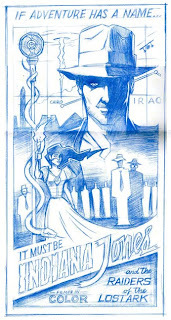 Anyways, here's an Indiana Jones thumbnail of a poster that's due in a week. I'll post the final hopefully soon.